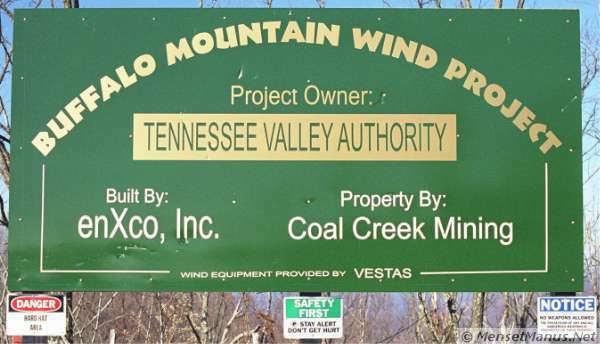 TVA's Buffalo Mountain Wind Power Plant - Friendly? TVA had a dedication ceremony for the wind power plant. I wasn't invited, but they had the usual people giving the usual statements for the press. See the Oak Ridger Newspaper's 11/14/00 article for more details. This page is dedicated to the occasion. Shortly after the dedication event, I went for another visit. For once the sky was clear and blue, but the turbines were hardly spinning, and only in starts and stops. In several visits since the testing began in mid-September, I've only been lucky enough to see them turning at speed (~30 RPM) only once. Even on that occasion only 2 of the 3 were turning. They are probably having some typical plant startup problems which is to be expected for any new power plant installation. I have seen the blades turning at speed a few times in the distance from the city of Oak Ridge. At that distance one of the towers is partially obstructed by the hillside, however, and one's perception of the motion may be affected by the direction the blades move while the turbines adjust to face into the wind. In any case, I wanted to consider friendliness, not availability. Wind plant proponents like to say that wind power is friendly to the environment. 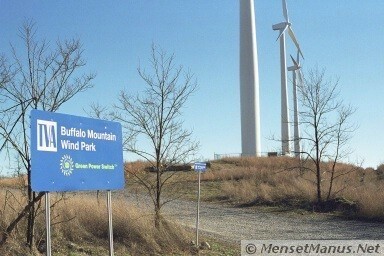 This page mainly focuses on how friendly this wind power site is in its own home environment atop Buffalo Mountain. The first pictures show the Project sign I noticed at the site on my first visit after construction was completed. This Project sign is located at the edge of a graveled parking area at the Northwest end of the site. When you face this sign, you face approximately to the North with your back to the turbines. The sign had some evidence of minor damage, which I had not noticed before. In the large picture above, scrapes or dents can clearly be seen. I don't know the cause, but if it was intentional damage, it would be a sign of a less than friendly environment. Should the unfriendly environment be blamed on the wind plant? The Project sign was probably erected during the construction phase. Since the construction involved raising equipment very high into the air, it is not surprising that there would be a risk of objects falling onto workers below. 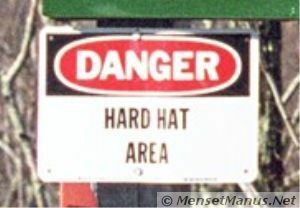 Now that construction is over, however, it is interesting that the small Danger Hard Hat Area sign has not been removed. 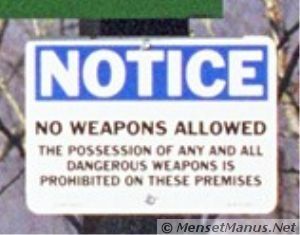 A more ominous sign of a less than friendly environment is the No Weapons Allowed sign. Are they trying to protect the curious public from the windmills, the windmills from hunters, or what? The next couple pictures show interesting contrasts. At left is the Welcome to the Wind Park sign. In green letters it has the "Green Power Switch" slogan. From the the location of the Project sign above, this view is seen by turning to your right about 120 to 180 degrees and taking a few steps. What is the very small sign on a single pole, to the right of the big Park sign? It is one of the many No Trespassing signs. Just when we were thinking we might be invited to have a picnic under the towers, or maybe meditate in the sun, we have to think twice about whether we are even invited into the "Park." 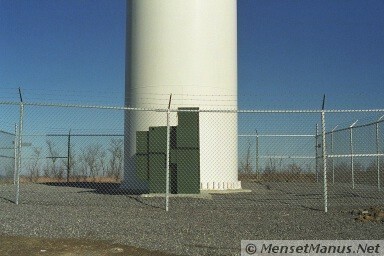 Another new physical feature of the "park" is faintly visible around the base of the first tower - a barbed wire fence! Surprisingly, it gets even less friendly! Take a few more steps (to the right if I recall correctly), and you can see the next sign. What is this all about?! Barbed wire fences, physical and canine searches, No Trespassing. All who dare trespass here must surrender all rights against unreasonable search and seizure! Is TVA only trying to protect their investment and cover all the legal bases, or is there a hidden danger lurking here? Is there a chance of a low probability, high consequence event that could harm people if they are allowed to get too close? This wind power plant looks more and more like a conventional power plant. It does not seem very friendly to its environment. 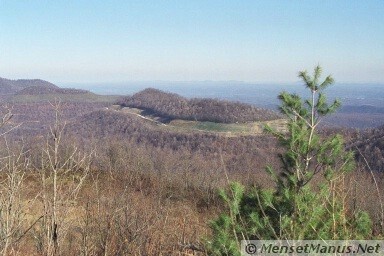 This final picture shows one of the many beautiful views from the top of Buffalo Mountain. This view is towards the Southeast, across Ligias Fork with Peachtree Gap to the left, from a location about a few hundred feet south of the wind power plant site. Signs of recent coal mining are apparent. The land is clearly affected, but after the mining is finished, the land will eventually recover if left alone. At least that is my unproven claim. Wind power plants inherently have one thing in their favor when compared with "conventional" sources of power, and only one thing - they consume no fuel to produce power and therefore they produce no direct pollution from fuel. Similar to sailboats, if the turbines could move, their gas mileage would be infinite, and their tailpipe emissions are zero. But does this alone justify paying 40% extra for their power? Not automatically. Not unless the benefits exceed the drawbacks. We used to favor hydro-power (dams) for the same reason, but now some people have second thoughts because of the non-pollution environmental effects of dams. Should we use sailing ships to travel the oceans? Perhaps when the benefits outweigh the drawbacks. Imagine the oceans covered with sailing ships. Imagine the Cumberland and Smoky Mountains covered with wind power plants. Do they have NO negative environmental impact? I have illustrated above some negative effects on the local environment of the power plant. Do the wind power plants have NO environmental pollution? Do they consume lubricants, plastic parts, or seals, etc.? Are they entirely pollution free? Do they use electrical power from other sources for lights, heating or cooling, or for monitoring equipment when they are not producing power due to low winds? To the extent that they do, they actually will cause an increase in the pollution produced from increased power production from other sources. This is surely very small, but it is not zero, and it increases with the number of idle turbines. All power sources should be considered based on their merits, and from what I have seen, TVA has not justified their claims that wind power is on balance environmentally friendly, certainly not to the extent to justify paying 40% extra. It is assumed that taking power from the wind in this way has no negative environmental impact due to the slowing of the wind. This may seem like a ridiculous comment because the amount of energy taken from the wind is so small compared to the total wind energy. As a humorous aside, the amount of wind reduction due to wind power is probably still very small compared with the wind increase due to transportation vehicles. Similar things have been said about human production of carbon dioxide compared with total production of carbon dioxide. Now some people think human carbon dioxide production is a problem despite being relatively small. Could there be a subtle harmful side effect from using wind energy? Could it alter weather patterns ever so slightly? Could slowing the wind near the surface in selected locations reduce the amount of dirt in the air and change the surface/sunlight interaction? Personally I wouldn't worry about it, but similar questions are raised about other power sources. The not so friendly local environmental effects of this wind power plant site will remain as long as the plant is operated as TVA has designed it. The plant hardware will not last forever, and eventually it will need to be replaced or decommissioned. This will have significant costs. We assume the plant would not be abandoned in place like mines have been, but it has happened before in other locations and it could happen here. If the plant were abandoned in place to avoid the costs of decommissioning, it could be a blight on the land and a danger to people for a long time. This land was on its way to recovery, or to being "reclaimed" by nature after being mined. There were places where the recovery was slowed by using the roads for recreation, but at least the land was available for such purposes. The natural process has been set back even more by installation of this wind power plant. Any power plant will have a site that is taken from a natural state for industrial purposes, but usually they are located in areas that already are expected to have industrial activities rather than recreational activities. It would be one thing to put this wind power plant in an existing industrial area, but TVA has put this power plant in a scenic location that could otherwise be used for park and recreation purposes. The extent of industrial areas has been expanded rather than decreased. How is this good for the environment? Shouldn't we conserve this land for such park and recreation purposes? What is the value of this perpetual damage to this environment? 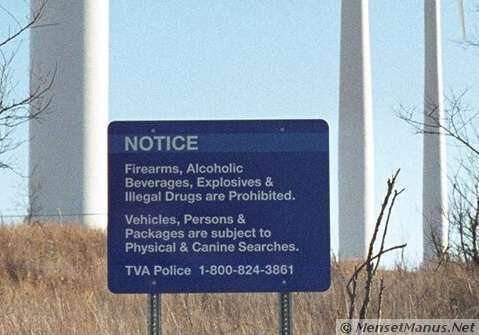 TVA could relatively easily improve the friendliness of the wind plant's local environment by taking down the unfriendly signs and allowing people to freely wander around or travel past the towers. They could put up an information booth and encourage visitors. The fact that they haven't is an indication that either there are dangers associated with being close to the towers, or TVA is afraid people in the area will damage the towers, or both. If events show that their fears about people damaging the towers are well founded, I think the root cause will partly be due to TVA attempting to block off access to the area. When I have been in the area I have observed people driving ATV's and dunebuggies nearby. I have seen hunters and/or target shooters in the general vicinity. Although I am not familiar with the roads to the north of the plant, it appears from maps that TVA has technically tried to block a road by putting up No Trespassing signs. Without significant increases in security resources, I do not think TVA can effectively enforce their No Trespassing policy. Obviously it is not acceptable for people to bring explosives and try to blow up the towers or to shoot at them with weapons, but signs threatening physical or canine searches will not be what stops people from doing it. I last touched this page on Saturday, 2007-11-17 at 05:08:58 UTC.